Rebekah and Eliezer at the well. HEN SARAH, ISAAC'S mother, was one hundred and twenty-seven years old, she died. Abraham had no place to bury her, so he bought a field containing a cave,, and Abraham buried Sarah in this cave. The field and the cave were called by the name of Machpelah. After Sarah's death, Abraham and Isaac felt lonely. Isaac was now grown to manhood, and Abraham thought he was old enough to be married. The parents usually choose wives for their sons, and husbands for their daughters, in those countries, and Abraham wished to choose a good wife for Isaac. He knew that the women who lived in Canaan were idol-worshipers, and that they would not teach their children to love the true God. Because he wanted Isaac's children to serve God, he would not choose a woman of Canaan to be Isaac's wife. Then Abraham remembered the news that had come to him from his brother Nahor, who lived at Haran, the place in the country of Mesopotamia where his aged father had died. Nahor was now the father of twelve sons. "Perhaps I can send back to my own people at Haran," thought Abraham, "and find a wife for Isaac." So he called his trusted servant,Eliezer, and asked him to journey back to Haran and try to find a God-fearing wife for Isaac. Eliezer knew that such a journey would require many days' time and would be attended by many dangers along the way. He knew, too, that Abraham's people might not be willing to send a daughter so far from home to become the wife of a man whom they had never met. But because he was a faithful servant Eliezer said, "I will go." Then the long journey began. Eliezer took with him ten camels, several attendant servants, and many valuable presents. For days and days they traveled, crossing valleys, hills, and rivers, and edging alongside the great, lonely desert. By and by they came to the northern part of Mesopotamia, and then at last their tired camels stopped outside the city of Haran and knelt down near a well. It was evening time, and the women of the city were coming to this well to fill their pitchers with water. Eliezer had learned to trust in Abraham's God, and now he lifted up his heart and prayed that God would send out to this well the young woman who would be suitable for Isaac's wife. "Let it come to pass, 0 Lord," he prayed, "that the young woman of whom I shall ask a drink may offer to draw water for my camels also. By this sign I shall know that she is the one whom you have chosen, for Abraham's sake, to he the wife of Isaac." While Eliezer was praying, a beautiful young woman approached, with an earthen pitcher upon her shoulder. Eliezer waited until she had filled the pitcher with water, then he asked for a drink. Although he was a stranger, she spoke kindly to him and said she would draw water for his camels also. Again and again she filled her pitcher and poured its contents into the trough that the thirsty animals might drink. When she had done this, Eliezer gave her some of the beautiful presents that he had brought, and asked whose daughter she was and whether her people could supply lodging for him and for his camels. At her reply that she was the granddaughter of Nahor, Abraham's brother, Eliezer knew that his prayer had been answered, and he bowed his head and worshiped God. Then Rebekah-for this was the young woman's name -told Eliezer that there was plenty of room in her father's house to lodge them all, and she hurried to tell what had happened at the well and to show the beautiful presents that Eliezer had given her. When her brother Laban heard her story and saw the costly ornaments which Eliezer had given to Rebekah, he ran eagerly to meet the strangers at the well and to invite them to come in. "We have room for you and for your camels," he told them, and they went with him into the city. Laban now showed the same kindness to his guests that Abraham and Lot had shown to their angel visitors. He first brought water to wash their feet and then set food before them. But Eliezer could not eat. "First let me tell why I have come," he said. "I am Abraham's servant, and God has blessed my master greatly, giving him flocks and herds, silver and gold, and many servants, besides camels and asses. God also gave to him and Sarah a son in their old age, and now Abraham has given all his great riches to his son. But as yet this son, Isaac, has no wife, and Abraham will not take a wife for him from the daughters of Canaan, because they worship idols. He has sent me, therefore, to you, to find a wife for Isaac." Eliezer told also how Rebekah, in answer to his prayer, had offered drink to him and to his thirsty animals. Rebekah's father and brother Laban were willing to let her go back with Eliezer because they believed that God had sent him. And Rebekah, too, was willing to go. Eliezer was grateful to know of their willingness, and he bowed his head once more to worship the great God who had helped him on his journey. Afterward he enjoyed the feast which Rebekah's people had prepared for them. That same night he gave other presents of silver and gold and beautiful clothing to Rebekah, and to her mother and brother. The next morning Eliezer said, "Now let me return to my master." Laban and his mother did not want to let Rebekah leave them so soon. "Can you not stay for a few more days? ", they asked. But when Eliezer insisted that he must go at once, they called Rebekah, and she said, "I will go." So they bade her good-by and sent her away with her nurse and other attending maids. On the homeward journey Rebekah and her maids rode the camels, and Eliezer led the way to Canaan. Very likely they traveled the same road that Abraham had traveled many years before, when he went with Sarah and Lot to the land that God had promised. At last they drew near to the place where Abraham and Isaac now lived. The evening shadows were stealing through the trees, and Isaac was out in the fields alone, thinking about God, when he saw the camels coming. He hurried to meet them, and Rebekah, seeing him, asked who he was. "This is my master, Isaac," Eliezer replied, and Rebekah alighted from her camel and covered her face with a veil. When Isaac met them, Eliezer told how God had answered his prayers and had sent Rebekah to him. 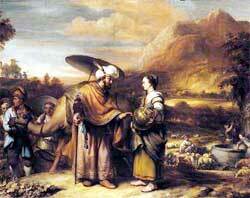 Isaac took her to his mother's tent, and she became his wife. He loved her, and did not grieve any more because of his mother's death. The time passed on, and finally Abraham died, too. He had reached the age of one hundred and seventy-five. Ishmael heard of his death and came to help Isaac bury his father. They placed his body in the cave where Sarah had been buried.